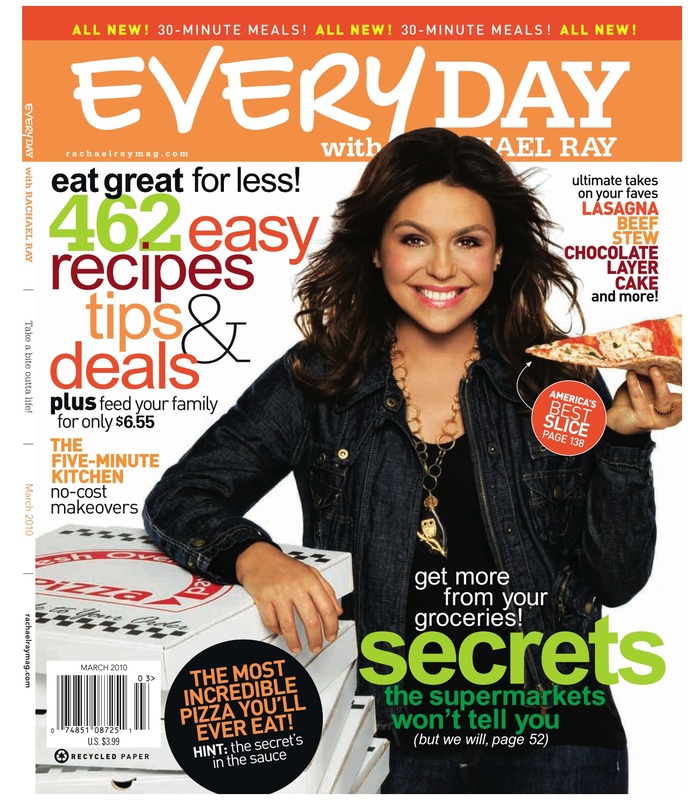 I’m so excited that my article in the March 2010 issue of Every Day with Rachael Ray is out on the newsstands. I love the publication and to regularly write for it has been a dream. This particular article was about how to overcome your food aversions. It was a tough topic to write up because most picky eaters don’t want to overcome their food aversions, but I really enjoyed researching the science behind picky eating. This is my 3rd of 5 articles for the magazine, which is thrilling. People often ask me how I developed my relationship at Every Day With Rachael Ray. I pitched the lifestyle editor a peanut butter article. She said she had one in the works but to keep pitching her. I sent her a new idea but she was leaving her post and she instead put me in touch with the editorial assistant. I pitched the EA with an idea and went back and forth. We settled on my first article, Play With Your Food, about food that’s also art — markers you can use to draw on cookies, paint you can eat, candy Legos, etc. The new lifestyle editor came on board and really liked the final version of Play With Your Food. Months later, she emailed me my very first assignment—writing up quick tips for dining table settings. If my editor needed it in a week (and most often she did), I would hand in my article the day before the deadline to show that she could trust me to get the work done on time. Word count. I stuck to it as close as I could. Any editorial questions, I answered immediately. If something wasn’t clear and the editor queried me about, I made sure to respond promptly because I know she’s busy trying to get other pieces edited. The quicker I can get back to her, the quicker she can move on. Research the hell out of the piece. If she wanted me to find an expert to interview on dining etiquette, I spent the night researching and finding the top 5 candidates. I specifically chose experts that would appeal to a Rachael Ray audience — fun, simple, and easy to understand. I truly love the magazine’s design and style and articles, and writing for this pub has been a true dream. So I worked hard to make every piece I wrote the best I could possibly make it. And I know that the editors will change it, that’s a given, but putting 110% in every time helped make me more of a “go to” freelance writer. For a list of all of the articles I’ve written for Every Day with Rachael Ray, visit my portfolio at www.mediabistro.com/JenniferChen. Hello! I’m excited to see that you’re doing so well and looking forward to reading your articles! Thanks Phoebe for reading my blog and your well wishes! How are you? I’m happy to still be writing after all those years in high school!